No great birthday celebration for Donna for her twenty-seventh birthday. She was working as the Chin Chin cast were opening at the Powers Theatre in Grand Rapids, Michigan. The cast, probably stayed at the Hotel Herkimer, a “refined home for professionals” a few blocks away. 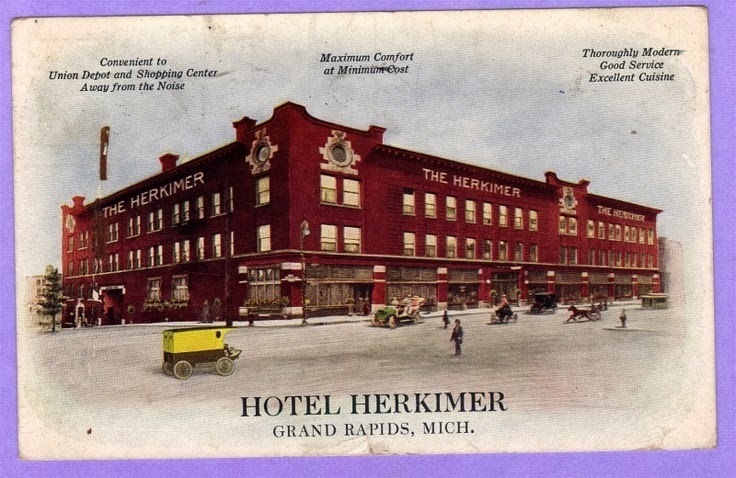 The Herkimer was a regular accommodation place for vaudeville shows. This was a return engagement, so most of the cast knew where things were in town. “Chin Chin” spent two nights at the Powers Theatre. Articles, press releases and advertising were scant in the Grand Rapids [evening] “Press,” but this city of about 135,000 had three other newspapers, the morning “Herald,” the evening “News,” and a weekly, the “Chronicle.” Pre-show newspaper articles in the “Press” indicated that they had new scenery and new costumes since the previous season’s showing in Grand Rapids. Between the first and second nights, the paper called out Donna by name. 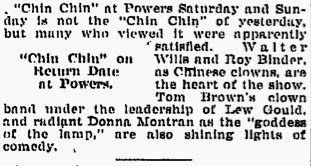 “Chin Chin” at Powers Saturday and Sunday is not the “Chin Chin” of yesterday, but many who viewed it were apparently satisied. Walter Wills and Roy Binder, as Chinese clowns, are the heart of the show. Tom Brown’s clown band under the leadership of Lew Gould, and radiant Donna Montran as the “goddess of the lamp,” are also shining lights of comedy. I hope she had a happy birthday celebration after the show. Construction of the original Powers’ Opera House began in 1873 and the theater opened on 12 May 1874. The original theater had a seating capacity of about 1300. The main floor was above ground level. That building succumbed to a fire in 1892 that gutted the interior, The interior was rebuilt and new four-story with rounded bays was added to the east end of the building. On September 13, 1901 the theater was again aflame. 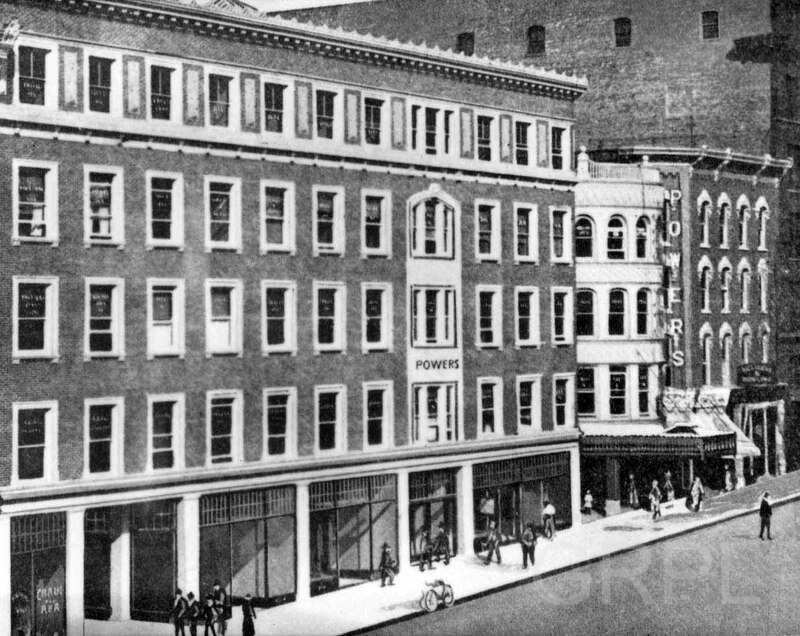 This time, the fire totaled the building which caused it to be rebuilt completely as the Powers’ Theater. The rebuilt design put the main theater floor at ground level and increased capacity. In 1914, the old facade was replaced with a new brick and terra cotta facade. The Powers’ Theatre was the largest theatre in Grand Rapids when Donna and Chin Chin played there in 1920. Grand Rapids had a population of about 135,000 and the theater had a capacity of 1,619, which means that more than 1% of the city’s population could attend a show there. The stage was very large, sixty-six feet wide and forty feet deep. Backstage was also spacious with sixty-five feet up to the rigging loft. The 1913 Theatrical Guide indicates that it used 110 volt direct current for its illumination. Don’t know when it’s DC system was replaced with alternating current (AC). The theater underwent several additional renovations and another fire, and renovation, in 1942. In 1944, it opened up as “Foto News” and ran newsreals. The theater was remodeled again in 1948 and converted to become the Midtown Theater which it stayed as until 1972 when it closed. It was rented for a few concerts and other activities for a few years, but when renovation costs got to be too much it was torn down in January of 1979. Today the location is a parking ramp. Website: History Grand Rapids Org. – Early Grand Rapids Halls and Theaters by Albert Baxter. The Julius Chan-Gus Hill Theatrical Guide and Moving Picture Supplement 1922.